Hello to everyone - I am the mother of Illyanna "Lilly". First, I will give a quick medical background. Lilly was diagnosed with Kabuki at 20 months of age. 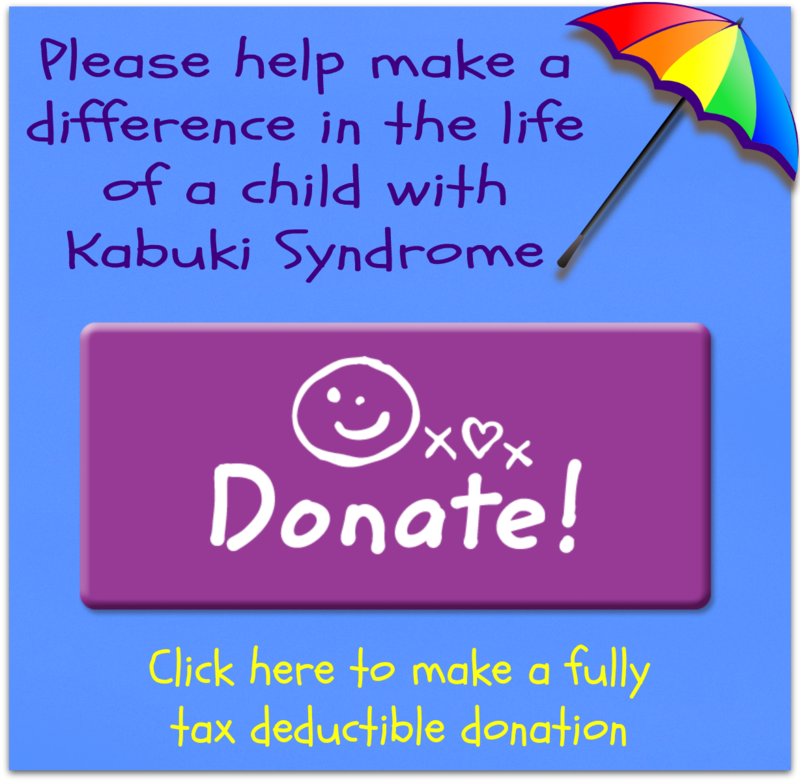 We knew before she was officially diagnosed that she had Kabuki just from visiting the web sites and from other pictures of kids with Kabuki. When you see pictures of her, you will agree too. Lilly was born very prematurely at 24 weeks. She was 1 lb. 12 1/2 oz. (about 800 kg). She went all the way down to 1 lb. 6oz. (about 695kg) before she started to gain. She spent 4 months in the NICU. We went through heart surgery (PDA), laser surgery (both eyes-ROP), NEC, peg-tube placement, reflux, and of course the other typical preemie problems. She was born with a cleft of the soft palate (the first on either side of our families). Since she came home, she has had tubes in her ears 3 times, palate repair surgery, ear infections, pneumonia a few times, a couple hospital stays (croup and RSV), sinus infections and numerous colds. She is currently 100% g-tube fed. Lilly was diagnosed with hypothyroidism and recently diagnosed with an ASD (left atrium). She is delayed (up to a year) in all developmental areas. She now wears glasses. We have been through 2 DOC bands to reshape her head. Lilly is BEAUTIFUL!!! She is a fighter. She amazes us each day with what she knows (perceives) about the world around her. Just the way she expresses herself. She craves loud, bright, rough one minute and cuddles the next. She is very "free" with her love to everyone she meets. Lilly loves the "in your face" excitement one moment, then turns around and is so gentle the next. She is always the "rock star" at the hospital. It is so amazing what these kids "just know" about life! My husband and I are constantly asked "how do you do it?" You just do. I do not know any other way. She is our daughter. We love her as she is. We all love our children-no matter what! We hope you have enjoyed the story of our "Tiger Lilly". We also hope you all will enjoy the pictures of Lilly as we have enjoyed the pictures of your children.